Most unexpectedly, the best part of our heart and soul has been torn away, leaving behind a dark, gaping, painful wound. Wade Chamberlain was an exceptional man in so many ways. He shared freely with others his manifold gifts and virtues, and the way he lived his life stands as an example to everyone he knew, young, old and in between. Many people have talents. But in the more than half a century I have trod this earth, never have I known anyone in whom so many rare and disappearing qualities converged in a single, irreplaceable human being. Wade was a champion autocrosser many times over, and a true master of one of the most dangerously unruly expressions of the automotive dark arts ever conceived. A brilliant engineer, mechanic, and inventor. A paragon of self-reliance (who else but Wade would think to use his own urine as coolant in a roadside radiator failure?!). A brewer whose creations far outshone the meager products of the trendy craft brewing industry. A mischievous prankster with a biting sense of humor. A relentless competitor, who was never content to rest on the thick bed of laurels he earned, but who always pushed himself to greater heights. Above all, a loving and loyal husband and father, who cherished his wife Beth, and his wonderful son Adam and daughter Shayna. But unlike so many gifted people, Wade never needed to display arrogance or put on airs. He was always quick to get folks in trouble out of a jam, or to help with some filthy unpleasant task (as much as he hated those). He was not particularly demonstrative, but if he loved you, you damn well knew it, through his constant actions and deeds. Wade had the rare innate ability to give all he had in every moment and task he undertook in his life, without making a big deal out of it. There will never, ever, be another like him. And while we grieve that he was taken from us far too soon, and himself deprived of the many, many joyous moments we were looking forward to sharing, how lucky and blessed all of us are to have basked in the incandescent light of his amazing life, albeit too briefly. I will forever be grateful for the precious gift of his true friendship, and the only consolation for the loss and emptiness I now feel are the countless beautiful memories of the good times we shared. It is unimaginable that the grid spot next to me will never again be filled by his beloved No. 22 Cobra. By now he’s on his way on that Unknown Journey we all must take. 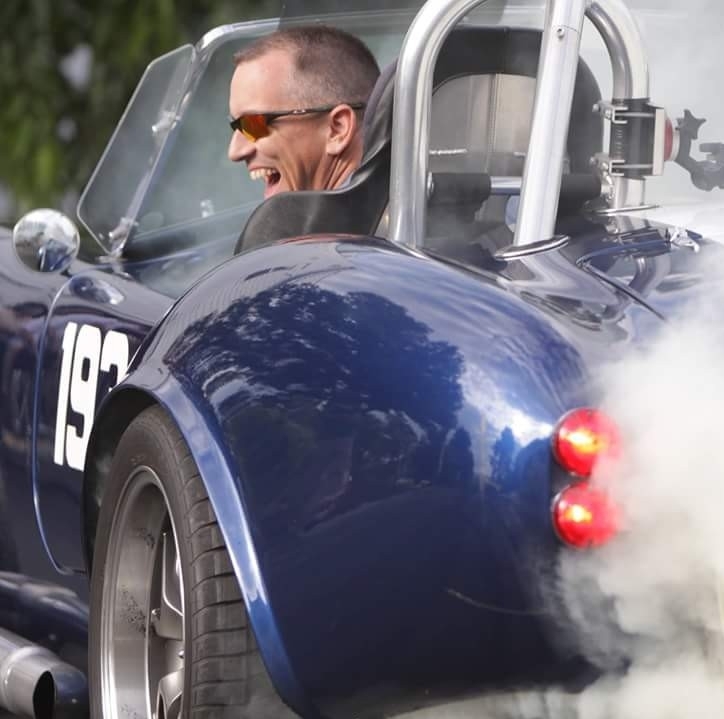 God’s course workers may want to stand back a few feet, because Wade will be knocking down Heaven’s door with his small block roaring at the top of the tach, tail wagging, and tire smoke pouring from his wheel wells. From the Desktop of Benjamin Lambiotte, Esq.